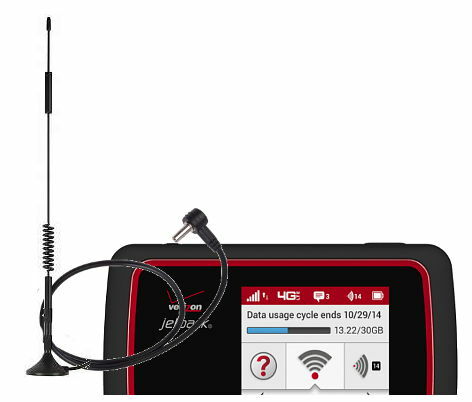 How To Boost The Cell Signal To A Verizon Jetpack 6620L Hotspot. A cost effective way to increase the cellular signal strength to your 6620L MiFi device is to attach an external antenna. The 6620L has a small antenna port located on the side (covered by a plug). We have an external antenna adapter (see products below) that connects to this port and to an antenna. We offer a variety of cellular antennas you can attach for buildings or vehicles. A powered cellular amplifier works by taking the available wireless signal, amplifying it, then rebroadcasting it to and from your cellular device. You can also use powered amplifiers including cellular repeater type systems that don't connect to your device at all. We list several of these types of cellular signal booster systems below. Below are other options to boost the signal to your Verizon MiFi. More powerful solutions can also boost the signal in larger areas within buildings and vehicles. For boosting the 4G signal to your MiFi Hotspot, select a 4G signal booster. The boosters below all improve the cell signal for Verizon's 700MHz LTE 4G frequency as well as their 3G signal.